NHL and I are Munchkin addicts. We just love playing a good game of Munchkin and killing monsters while backstabbing or helping each other. There are also a ton of expansion packs and other versions of Munchkin which can be added to the original (or, in the case of the latter, played on their own) to add variety. While the quality on those is exceptional and I’d love to load up on all of them, there’s one problem. We just can’t afford it. Sadly, daily expenses eat too much of our money to go on a Munchkin buying spree. So what’s a Munchkin-loving geek to do? Well, early last month, a tweet from @VisionaryLight (retweeted by @SJGames) inspired me. Her son made some cards to add to his Munchkin game. I thought that this was genius. Why not use the blank cards that were included with our Munchkin set to make some of our own cards? Not only could we add in treasures or monsters of our choice, but we could custom tailor them to our geeky interests. We could make Munchkin cards of franchises that Steve Jackson Games doesn’t have the rights to. For example, instead of using a Staff of Napalm to destroy a Plutonium Dragon, why not use a Lightsaber to defeat a Rancor? Or command Mjolnir to strike a Frost Giant? And why limit yourself to one franchise when you can combine them? Perhaps you could use a Proton Pack (ala Ghostbusters) to zap a Klingon. The possibilities are endless. A second inspiration struck courtesy of @DrSbaitso. 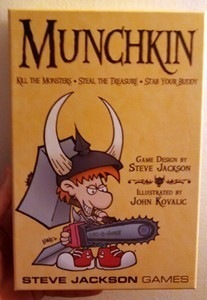 Steve Jackson Game’s website was going down for maintenance and Dr. Sbaitso joked about needing to buy “Munchkin: Procrastinator.” Of course, there is no such set, but it struck me as a brilliant idea. Why not build a set based on not killing the monster, but putting off killing it? UPDATE: After this post went live, I received a note from a representative from Steve Jackson Games. While they were very nice, they noted that “making custom Munchkin cards is a violation of trademark (Munchkin) and copyright (design and mechanics of the game).” I try very hard to respect the copyright and trademarks of the companies that produce the things I love. (I try to respect copyright/trademark in general, but especially the folks who make stuff I like.) In my excitement over my card ideas, I mistakenly stepped over the line. The last thing I’d want to do is cause a problem for Steve Jackson Games. To correct this error, I’ve removed the images and edited the post. Thanks again to Steve Jackson Games for such a wonderful game and I apologize for stepping over the line.